This piece was painted initially from the window of one of the holiday homes at the Pacific Harbour Lodge, Tairua in New Zealand where we stayed for a night on holiday. The Estuary shown was the mouth of the Pepe stream, which lead to the title. 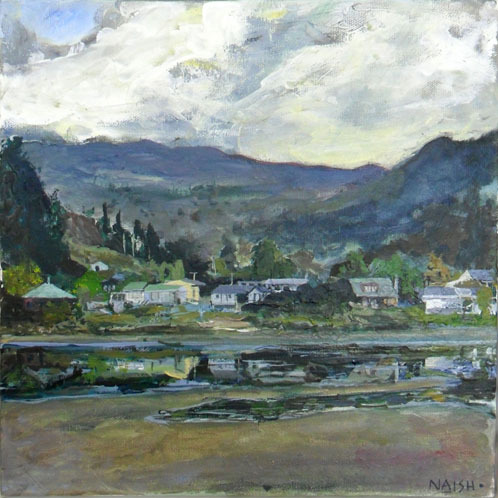 I was initially going to call the piece The Estuary, Tairua, New Zealand. But having mislaid my diary with the correct spelling of Tairua, I ventured onto Google Earth which also showed me that this ‘Estuary’ lead on to a larger one. So with no other label than the fact that this was the mouth of the pepe stream, I felt that I should title it accordingly. I’m not convinced by this title, as the waterway does not look like a stream; but hey – its factual. The initial session was a few hours in the evening where the light was dramatically changing, with palette knife application of paint. This wasn’t particularly a stylistic choice, more that I had forgotten my brushes! It did however help create a more immediate feel. This was in early October 2012, and having taken some reference photos I concluded the painting in a couple of sessions in my studio in January 2013. This was predominantly to give more clarity to the shore line buildings and reflection in the water.